스마트 그리드 네트워크(Smart Grid Network)를 구성하는 AMI 네트워크에서 전력기기를 관리하는 AMI 네트워크에서의 전력기기 관리 장치 및 방법을 개시한다. It discloses a smart grid network electrical equipment management in the AMI network to manage the power unit in the AMI network constituting the (Smart Grid Network) apparatus and methods. 일 실시예로서, AMI 네트워크에서의 전력기기 관리 장치 및 방법은, 전력 제어 그룹에서 전력기기가 탈퇴를 선언하면 전력 제어 그룹에 속한 전력기기에 관한 리스트를 제공하여 리스트에서 선택된 전력기기에 대해 탈퇴를 처리함으로써 전력기기가 탈퇴를 선언할 때 다른 전력기기도 탈퇴를 선언할 수 있도록 전력 제어 환경을 제공한다. In one embodiment, the electric equipment management apparatus and method in an AMI network, when the power device in the power control group declared to withdraw the withdrawal for the selected electrical equipment from the list to provide a list of the power devices belonging to the power control group processing the other power unit also provides power control scheme to declare the withdrawal when the power unit declaration by the withdrawal. 본 발명의 실시예들은 스마트 그리드 네트워크(Smart Grid Network)를 구성하는 AMI 네트워크에서 전력기기를 관리하는 AMI 네트워크에서의 전력기기 관리 장치 및 방법에 관한 것이다. Embodiments of the invention relate to a power device management apparatus and method in an AMI network to manage the power unit in the AMI network constituting the smart grid network (Smart Grid Network). 전력네트워크에는 전력을 생산하여 공급하는 전력공급자(Utility or Provider)와 전력공급자로부터 전력을 제공받아 소모하는 소비자가 있다. Power network, there are consumers who consume accepted providing power from a power supplier (Utility or Provider) and a power supplier for supplying power to produce. 전력공급자는 소비자와 전력계약을 맺고, 전력계약에 기반한 소비자의 전력사용량에 따라 소비자에게 요금이 과금된다. Power suppliers and power consumers has signed a contract, this fee is charged to the consumer in accordance with the power consumption of the consumer based on power contracts. 소비자의 전력사용량은 소비자 댁내(Premise)에 설치된 미터(Meter)로 측정되어 과금이 되며, 초기에는 전력공급자 직원이 직접 미터의 전력사용량을 읽어갔다. Power consumption of the consumers is billing is measured in meters (Meter) installed on the customer premises (Premise), initially the power supplier employees went to read the power usage of direct meters. 그 이후 전력공급자에 소속된 직원이 AMR(Automatic Meter Reading)네트워크를 통해 소비자 댁내에 설치된 미터의 전력사용량을 수집하는 기술로 진보하였다. Since then, the employees belonging to the power suppliers were advanced technology to collect power consumption of the installed customer premise meters from the AMR (Automatic Meter Reading) network. 최근 첨단기술로 주목받는 AMI(Advanced Metering Infrastructure) 네트워크에서는 미터로부터 전력사용량을 읽어가는 것(Metering)뿐만 아니라 소비자에게 가격정보(Pricing) 서비스, 수요반응 전력제어(DRLC: Demand Response & Load Control) 서비스, 메시징(MSG: Messaging) 서비스, 요금정보(Billing) 서비스, 분산전원제어(DERC: Distributed Energy Resource Control) 서비스를 제공하고 있다. Recent high-tech attention AMI (Advanced Metering Infrastructure) network, as well as (Metering) going to read the power usage from the meter to the prices (Pricing) services, demand response power control consumer receives a (DRLC: Demand Response & Load Control) Service and provide: (distributed Energy Resource control DERC) services, messaging (MSG messaging) services, pricing information (Billing) services, distributed power control. AMI 네트워크 기술은 지그비 연합(ZigBee Alliance)의 표준 프로파일(Profile)인 스마트 에너지 프로파일(SEP: Smart Energy Profile)로 정의되어 있다. AMI network technology, ZigBee Alliance Smart Energy profile standard profile (Profile) of (ZigBee Alliance): is defined as (SEP Smart Energy Profile). AMI 네트워크에는 전력공급자와 소비자를 네트워크로 연결시켜주는 에너지 서비스 인터페이스(ESI: Energy Services Interface), 댁내의 AMI 서비스 표현을 담당하는 댁내 디스플레이(IPD: In-Premise Display or IHD/In-Home Display), 온도 조절을 위한 스마트 서머스탯(Smart thermostat), 전력 사용제어를 위한 전력 제어(LC: Load Control), 전력사용량을 수집하는 계량기(Meter), 전력자동차(Plug-In Electric Vehicle), 스마트 가전기기(Smart Appliance), 선불단말기(Pre-Payment Terminal), 댁내에너지관리시스템(Premises Energy Management System)등을 정의하고 있으며, 계속 추가될 예정이다. AMI network interface energy service that connects the power supplier and the consumer network (ESI: Energy Services Interface), premises Display responsible for the AMI service representation of the premises (IPD: In-Premise Display or IHD / In-Home Display), smart Thermostat (smart thermostat), power usage, power control for the control for temperature control (LC: Load control), the instrument that collects power usage (Meter), power cars (Plug-In Electric Vehicle), smart appliances ( and to define, such as Smart Appliance), prepaid handsets (Pre-Payment terminal), customer premises energy management system (premises energy management system), it will continue to be added. 현재 스마트 에너지 프로파일이 정의하고 있는 방식에 따르면, 에너지 서비스 인터페이스로부터 수요반응 전력제어 이벤트를 수요반응 전력제어 프로토콜에서 정한 전력 제어 장치가 수신하고, 수요반응 전력제어 이벤트를 처리한다. Current smart energy profile, according to the scheme of the definition, the power control device set by the power control response protocol need to power control demand response event from the energy service interface receives and processes the power control demand response event. 소비자가 전력 제어 장치에서 처리 중인 수요반응 전력제어 이벤트를 중지시키고자 탈퇴(Opt-Out) 버튼을 눌러 전력 제어 장치에 탈퇴 명령을 내린다. Consumers pressing the handle demand response power control to stop the events and characters withdrawal (Opt-Out) button that is in the power control unit issues a command to leave the power control device. 전력 제어 장치는 수요반응 전력제어 이벤트의 처리를 중지함을 에너지 서비스 인터페이스에 보고한다. Power control device reports that a stop processing of the demand response event to the power control energy service interface. 현재에는 스마트 에너지 프로파일이 탑재된 스마트 에너지(Smart Energy) 제어 장치들 수가 매우 적어 소비자 댁내에 설치된 작은 수의 전력 제어 장치에만 소비자가 가서 직접 명령하면 되지만, AMI 기술의 발전으로 많은 수의 스마트 에너지 제어 장치들을 소비자가 관리하게 된다면, 이는 여간 불편한 일이 아닐 수 없다. Currently, the Smart Energy profile is the Smart Energy (Smart Energy) control with the number of very small, but you only consumers to go directly to the command power control of a small number installed on the consumer premises, a large number of smart energy control of the development of AMI technology If consumers are to manage the devices, which can not not be put together inconvenient. 이러한 불편이 일반 가정에서는 현재 크게 문제가 되지 않을 수 있으나, 빌딩이나 공장 같은 경우에는 이 불편을 해결하기 위한 기술이 필요하게 될 것이며, 장차, LED(Light Emitting Diode)조명들에 값싼 유/무선장치들을 장착하여 개별 제어하는 기술들의 개발, 집밖에 세워두며 충전 및 전력공급을 하는 분산전원으로서의 전력자동차의 실제화, 콘센트(Outlet)에 부착된 전력 제어 장치가 연결된 전기기기를 대신해서 에너지 서비스 인터페이스와 스마트 에너지 프로파일 통신을 하는 것이 아니라, 가전기기가 스마트 에너지 프로파일 장치를 내장하여 직접 스마트 에너지 프로파일 통신을 하는 스마트 가전기기의 출시가 실현된다면, 기존의 스마트 에너지 프로파일 처리 방법에 많은 변화가 필요할 것이다. This however uncomfortable this may not be the current big issues in homes, buildings and factories, if such there will be a need for a technique to solve this inconvenience, in the future, LED (Light Emitting Diode) a cheap wireless / wired devices to the lighting attached to separate the development of techniques to control, by dumyeo built in the outside of the home instead of the charging and power actualization of distributed generation as a power car of the supply, the electrical device is a power control device attached to the outlet (outlet) associated energy service interface and the smart of instead of the energy profile communication, if the home appliance is built to directly achieve the release of the smart appliances to the smart energy profile, communication device, a smart energy profile, it would require a number of changes to the existing smart energy profile method. 본 발명의 일실시예는 전력 제어 그룹에서 전력기기가 탈퇴를 선언하면 전력 제어 그룹에 속한 전력기기에 관한 리스트를 제공하여 리스트에서 선택된 전력기기에 대해 탈퇴를 처리하는 AMI 네트워크에서의 전력기기 관리 장치 및 방법을 제공한다. One embodiment of the invention the power device management apparatus of the AMI network to process the withdrawal for the selected electrical equipment from the list to provide a list on the electrical equipment that belongs to when the power device in the power control group declared to withdraw power control group provide and how. 또한, 본 발명의 일실시예는 전력기기에 속성 정보를 구성하고 전력기기가 탈퇴를 선언할 때 속성이 일치하는 전력기기의 리스트를 제공하여 리스트에서 선택된 전력기기에 대해 탈퇴를 처리하는 AMI 네트워크에서의 전력기기 관리 장치 및 방법을 제공한다. Further, one embodiment of the invention is in the AMI network to process the withdrawal for the selected electrical equipment from the list to provide a list of the power device attribute is matched to configure the attribute information to the power device and declare the power device withdrawal the device provides a power managing apparatus and method. 또한, 본 발명의 일실시예는 소비자의 탈퇴 조작에 응답하여 전력기기가 탈퇴를 선언할 때 전력 제어 그룹에 속한 전력기기에 대해 탈퇴 여부를 소비자에게 질의해서 전력 제어 대상인 전력기기의 탈퇴 여부를 결정하는 AMI 네트워크에서의 전력기기 관리 장치 및 방법을 제공한다. In addition, an embodiment of the present invention determines the withdrawal whether or not whether or not to leave the power subject to the consumer power control to query the device for electrical equipment belonging to the power control group, when the power unit in response to the withdrawal operation of the consumer to declare the withdrawal It provides power device management apparatus and method in an AMI network. 또한, 본 발명의 일실시예는 전력기기에 대응한 대체기기를 설정하고 전력기기가 탈퇴를 선언하면 탈퇴를 선언한 전력기기에 대응하여 설정된 대체기기를 동작시키는 AMI 네트워크에서의 전력기기 관리 장치 및 방법을 제공한다. In addition, an embodiment of the present invention set up to replace the device corresponding to the electrical equipment and when the power unit is declared to withdraw electric equipment management in the AMI network for operating a replacement device is set to correspond to the power unit declares a withdrawal device and there is provided a method. 또한, 본 발명의 일실시예는 탈퇴를 선언한 전력기기에 대해 우선 순위를 조정하고 탈퇴 선언 이벤트가 발생하면 우선 순위가 높은 전력기기에 대해 탈퇴 여부 또는 대체 동작 여부를 질의하는 AMI 네트워크에서의 전력기기 관리 장치 및 방법을 제공한다. Further, one embodiment of the present invention is the power in the AMI network for adjusting the priority, for a power device declares a withdrawal and query withdrawal status, or whether the substitute operation on the withdrawal declared event is when high-priority power equipment occurs It provides an equipment management device and method. 또한, 본 발명의 일실시예는 전력기기가 탈퇴를 선언하면 탈퇴 시점을 지연시켜 잘못 선언된 탈퇴에 대해 대처하는 AMI 네트워크에서의 전력기기 관리 장치 및 방법을 제공한다. Further, one embodiment of the invention is to delay the withdrawal point in time when the power unit declaration of withdrawal provides power device management apparatus and method in an AMI network to react to the fault declaration unsubscribe. 상기의 일실시예를 이루기 위한, AMI 네트워크에서의 전력기기 관리 장치는, 소비자 조작을 입력받아 전력 제어 그룹 내 제1 전력기기에 대해 탈퇴를 선언하는 탈퇴 선언부; Electric equipment management apparatus of the, AMI network for making the embodiment of, the withdrawal unit declaration declaring the withdrawal for the consumer receives the operating power control group within the first power device; 및 탈퇴 선언부에서 탈퇴가 선언되면, 전력 제어 그룹에 속한 전력기기에 관한 리스트를 제공하여 선언된 탈퇴에 대해 처리하는 탈퇴 처리부를 포함한다. And when the withdrawal is declared in declaration withdrawal unit, and a processing unit for withdrawal process for the withdrawal declared by providing a list on the electrical equipment belonging to the power control group. 또한, 상기 일실시예를 달성하기 위한 기술적 방법으로서, AMI 네트워크에서의 전력기기 관리 방법은, 소비자 조작을 입력받아 전력 제어 그룹 내 제1 전력기기에 대해 탈퇴를 선언하는 단계; Further, the step of declaring a withdrawal for a technical means for achieving the aforementioned one embodiment, the electric equipment management method comprising: receiving a customer operation within the power control group of the first power device of the AMI network; 탈퇴가 선언되면, 전력 제어 그룹에 속한 전력기기에 관한 리스트를 제공하는 단계; Further comprising: when the withdrawal is declared, provide a list of the power devices belonging to the power control group; 및 리스트에서 선택된 전력기기에 대해 탈퇴를 처리하는 단계를 포함한다. And a step of treatment of withdrawal for the selected electrical equipment from the list. 본 발명의 일실시예에 따르면, 전력 제어 그룹에서 전력기기가 탈퇴를 선언하면 전력 제어 그룹에 속한 전력기기에 관한 리스트를 제공하여 리스트에서 선택된 전력기기에 대해 탈퇴를 처리함으로써 전력기기가 탈퇴를 선언할 때 다른 전력기기도 탈퇴를 선언할 수 있도록 전력 제어 환경을 제공한다. According to one embodiment of the invention, the electric power when in the control group, the power unit declaration withdrawal declare the power device withdrawal by treatment of withdrawal for the selected electrical equipment from the list to provide a list of the power devices belonging to the power control group also provides a power control scheme to declare the withdrawal other electric equipment to. 또한, 본 발명의 일실시예에 따르면, 전력기기에 속성 정보를 구성하고 전력기기가 탈퇴를 선언할 때 속성이 일치하는 전력기기의 리스트를 제공하여 리스트에서 선택된 전력기기에 대해 탈퇴를 처리함으로써 탈퇴를 선언한 전력기기의 속성과 일치하는 전력기기에 대해 탈퇴 처리를 동일한 시점에 처리할 수 있다. Further, according to one embodiment of the invention, the withdrawal by configuring the attribute information to the power unit, and when the power unit declaration of withdrawal by providing a list of the power device the attribute matching processing of withdrawal for the selected power devices from the list the withdrawal process on the power to the device to match the attributes of a power unit declaration may be treated at the same time. 또한, 본 발명의 일실시예에 따르면, 소비자의 탈퇴 조작에 응답하여 전력기기가 탈퇴를 선언할 때 전력 제어 그룹에 속한 전력기기에 대해 탈퇴 여부를 소비자에게 질의해서 전력 제어 대상인 전력기기의 탈퇴 여부를 결정함으로써 소비자가 지시하는 탈퇴 조작에 능동적으로 대처할 수 있다. Further, according to one embodiment of the invention, whether or withdrawal of electric power subject to the consumer power control to query the device whether the withdrawal for the power devices belonging to the power control group at the time in response to the withdrawal operation of the consumer power the device to declare the withdrawal the decisions by which to respond actively to the withdrawal operation that instructs consumers. 또한, 본 발명의 일실시예에 따르면, 전력기기에 대응한 대체기기를 설정하고 전력기기가 탈퇴를 선언하면 탈퇴를 선언한 전력기기에 대응하여 설정된 대체기기를 동작시킴으로써 탈퇴가 선언된 전력기기를 대체하는 전력기기를 동작시켜 전력 제어 그룹을 원활하게 구성할 수 있다. Further, according to one embodiment of the invention, setting a replacement device corresponding to a power device and a power unit, declaring a withdrawal response to withdrawal it is declared by operating the replacement device configured to declare a withdrawal power device power unit It operates the device to replace the power can be smoothly configure the power control group. 또한, 본 발명의 일실시예에 따르면, 탈퇴를 선언한 전력기기에 대해 우선 순위를 조정하고 탈퇴 선언 이벤트가 발생하면 우선 순위가 높은 전력기기에 대해 탈퇴 여부 또는 대체 동작 여부를 질의함으로써 탈퇴 선언이 빈번한 전력기기에 대해 탈퇴 여부 또는 대체 동작 여부를 신속하게 처리한다. Further, according to one embodiment of the present invention, adjusting the priority to the power unit declaration of withdrawal and withdrawal declared by querying whether or replace operation if withdrawal for withdrawal, declaring an event occurs, high priority electric equipment is to expedite the processing whether or replace operation if withdrawal for frequent power unit. 또한, 본 발명의 일실시예에 따르면, 전력기기가 탈퇴를 선언하면 탈퇴 시점을 지연시켜 잘못 선언된 탈퇴에 대해 대처함으로써 전력기기의 탈퇴 선언을 신뢰도 높게 처리한다. Further, according to one embodiment of the invention, the withdrawal handle declaration of the power unit when the power unit is highly reliable by the declaration unsubscribe to delay the withdrawal point, it reacts to withdraw invalid declaration. 도 1은 본 발명의 일실시예에 따른 전력기기의 구성을 보인 블록도이다. 1 is a block diagram showing a configuration of a power unit according to an embodiment of the present invention. 도 2는 본 발명의 일실시예에 따른 전력제어이벤트 공급자와 복수의 전력 제어 장치가 탈퇴 이벤트를 처리함을 보인 흐름도이다. Figure 2 is a flow chart showing that processing a power control event providers and a plurality of power control devices withdrawal events in accordance with one embodiment of the present invention. 도 3은 본 발명의 일실시예에 따른 전력제어이벤트 공급자와 복수의 전력 제어 장치가 속성 정보를 교환하는 동작을 보인 흐름도이다. 3 is a flowchart illustrating a power control event providers and a plurality of power control apparatus according to an embodiment of the present invention showing the operation of exchanging the attribute information. 도 4는 본 발명의 일실시예에 따른 전력제어이벤트 공급자와 복수의 전력 제어 장치가 참여 이벤트를 처리함을 보인 흐름도이다. Figure 4 is a flow chart showing that the power control event providers and a plurality of power control devices in accordance with one embodiment of the invention process the events involved. 도 5는 본 발명의 일실시예에 따른 스타트 랜덤마이제이션 기간 전에 탈퇴 또는 참여를 수행하는 예를 보인 흐름도이다. Figure 5 is a flow chart showing an example of performing a withdrawal or participation before start random Mai Localization period according to an embodiment of the present invention. 도 6은 본 발명의 일실시예에 따른 스타트 랜덤마이제이션 기간 안에 탈퇴 또는 참여를 수행하는 예를 보인 흐름도이다. Figure 6 is a flow chart showing an example of performing a withdrawal or participate in a random start Mai Localization period according to an embodiment of the present invention. 전력기기(100)는 소비자 조작을 입력받아 전력 제어 그룹 내 제1 전력기기에 대해 탈퇴를 선언하는 탈퇴 선언부(110)와, 탈퇴 선언부(110)에서 탈퇴가 선언되면, 전력 제어 그룹에 속한 전력기기에 관한 리스트를 제공하여 선언된 탈퇴에 대해 처리하는 탈퇴 처리부(120)를 포함한다. Power unit 100 receives the consumer operation and withdrawal declaration 110 to declare the withdrawal for the first power device within the power control group, when the withdrawal is declared in the withdrawal declaration portion 110, belonging to the power control group and a withdrawal processing unit 120 for processing on the withdrawal declared by providing a list of the power unit. 전력 제어 그룹은 그룹에 속한 전력기기(100)의 속성 정보를 구비하고, 탈퇴 처리부(120)는 전력기기(100)의 속성 정보를 참조하여 속성 정보와 일치하는 전력기기의 리스트를 제공한다. Power control group having the attribute information of the power device 100 in the group, and the reference to the attribute information of the withdrawal processing unit 120, a power unit 100, and provides a list of the power unit to match the attribute information. 탈퇴 처리부(120)는 탈퇴를 선언한 전력기기(100) 이외 전력 제어 그룹에 속한 전력기기에 대해 탈퇴 여부를 질의한다. Withdrawal processing unit 120 queries whether the withdrawal for the electric equipment belonging to other than the power control group, the power device 100 declares a withdrawal. 대체기기 설정부(130)는 제1 전력기기에 대응한 대체기기로 제2 전력기기를 설정한다. Setting unit 130 replaces unit sets the second power device to a replacement device corresponding to the first power unit. 탈퇴 처리부(120)는 제1 전력기기의 탈퇴 선언에 연동하여, 제2 전력기기를 동작시킨다. Withdrawal processing unit 120 in association with the withdrawal declaration of the first power device, to operate the second power device. 탈퇴 처리부(120)는 제2 전력기기에 대해 우선 순위를 조정하고, 제1 전력기기와 제2 전력기기 이외 전력 제어 그룹에 속한 전력기기에 대해 탈퇴 여부 또는 대체 동작 여부를 질의한다. Withdrawal processing unit 120 queries the second arbitration priority over the power unit and first power unit and second power unit than if leaving for electrical equipment belonging to the power control groups, or replace operation or not. 탈퇴시점 지연부(140)는 탈퇴를 선언한 전력기기에 대해 탈퇴 시점을 지연시켜 다시 전력 제어 그룹에 참여할 기회를 제공한다. Withdrawal time delay unit 140 provides the opportunity to delay the withdrawal point for the power unit declares a withdrawal take part in the power control group. 전력제어이벤트 공급자와 전력 제어 장치는 전력기기에 포함된다. Power control event supplier and the electric power control device is included in the power unit. 전력제어이벤트 공급자(LCE Provider)로는 전력제어이벤트를 보낼 수 있는 모든 장치(예: 에너지 서비스 인터페이스(ESI), 댁내에너지관리시스템(PEMS), 댁내 디스플레이(IPD))가 가능하다. Power control event provider (Provider LCE) roneun any device that can send power control event (e.g. Energy Services Interface (ESI), premises energy management system (PEMS), premises display (IPD)) are possible. 전력제어이벤트 공급자가 전력제어이벤트를 LC1,2,..,n로 명명된 n개의 전력 제어 장치에게 전송한다. Power control event provider LC1,2 a power control event, ..., and transmits to the n power control device called n. 이후 소비자가 어느 한 전력 제어 장치(예:LC1)에서 전력제어이벤트를 벗어나기 위해 탈퇴(Opt-Out)한다. Since consumers any one of the power control device (for example: LC1) and withdrawal (Opt-Out) to escape from the power control event. 이때, 소비자가 다른 전력 제어 장치(예:LC2,3,4)를 같이 탈퇴하기를 원한다면, 종래에는, 소비자가 같이 탈퇴하기를 원하는 전력 제어 장치(예:LC2,3,4)를 직접 찾아가서 탈퇴 버튼을 눌러 탈퇴 명령을 내려야 한다. In this case, the consumer is different power control unit: if you want to (e LC2,3,4) to leave, as shown, conventionally, the power control device desires to leave the consumer as: go and (e LC2,3,4) directly Press the button to leave to make a withdrawal command. 하지만 본 발명의 일실시예에서는 전력제어이벤트 공급자나 전력 제어 장치가 소비자에게 같이 탈퇴하기를 원하는지를 확인한다. However, in one embodiment of the present invention confirmed that wants to control the power supplier or a power control event withdrawal device such as to the consumer. 만약 소비자가 원한다면, 전력제어이벤트 공급자나 전력 제어 장치(LC1)를 통해 지정된 전력 제어 장치(예:LC2,3,4)가 탈퇴하도록 요청한다. If the consumer wants, the power control unit specified by the power control event provider or power control device (LC1) (example: LC2,3,4) a request to leave. 전력제어이벤트 공급자가 전력제어이벤트에 대해 탈퇴를 요청받았을 때 전력제어이벤트 공급자나 전력 제어 장치는 미리 준비되고 함께 동작하기 위한 전력 제어 장치들의 후보를 표시한다. When the power control event provider receives the request to unsubscribe to the power control event the power control event provider or power control device is prepared in advance and displays a candidate of a power control device for operating together. 표 1에 도시된 디바이스 클래스는 다음과 같다. 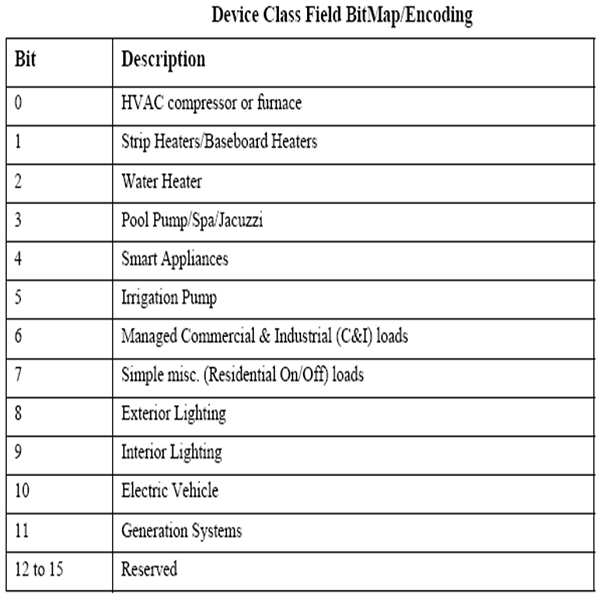 The device classes shown in Table 1 are as follows. 스마트 에너지 장치에는 Basic Cluster(Cluster ID:0x0000)가 필수 항목으로 존재하며, Manufacturer Name, Model ID, Power Source, Location Description, Physical Environment와 같은 속성들을 포함하고 있다. 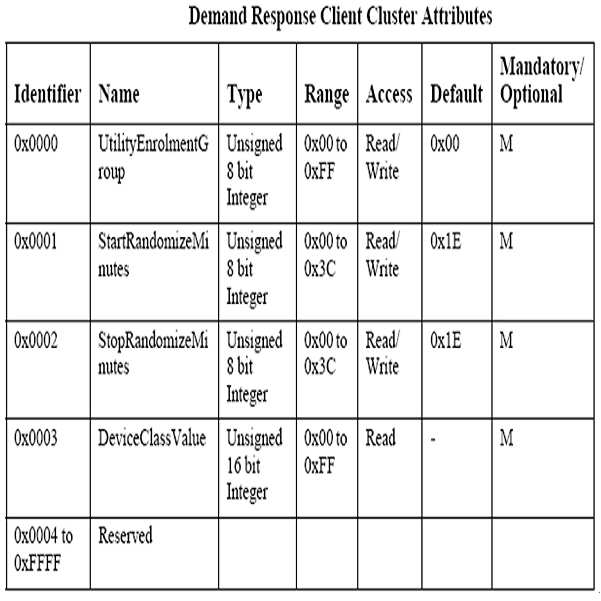 Smart Energy devices Basic Cluster: is present in the required fields (Cluster ID 0x0000), and includes attributes such as the Manufacturer Name, Model ID, Power Source, Location Description, Physical Environment. 전력제어이벤트 공급자나 전력 제어 장치가 같이 동작하기를 원하는 후보기기들을 선정하여, 소비자에게 질의할 수 있다. And a power control event providers or power control selection of the desired candidate device to operate, it is possible to query the consumer. 예를 들어, 전력 제어 장치가 전력 제어 그룹에서 탈퇴하였을 때, 전력 제어 장치와 가장 유사하거나 비슷한 위치에 위치한 다른 기기들을 후보로 할 수 있다. For example, the power control device can be when leaving the power control group, the other devices located in the most similar or similar location and the power control device as a candidate. 댁내에너지관리시스템이나 댁내 디스플레이는 소비자 댁내에 거의 하나씩만 존재한다. Premises or premises energy management system display is present in nearly one in customer premises. 소비자가 전력 제어 장치를 전력제어이벤트에서 탈퇴시켜야 하는 경우가 발생했을 때는 예외적인 상황일 경우가 많기 때문에, 댁내에너지관리시스템이나 댁내 디스플레이에 접근하는 것보다는 탈퇴 명령을 내리려고 전력 제어 장치 근처에 있을 가능성이 높다. Because in many cases be exceptional circumstances when there is generated when a consumer must withdraw the power control in the power control events, premises energy management systems or to flush the withdrawal command, rather than access to the premises display to be near a power control unit very likely. 게다가 댁내에너지관리시스템과 댁내 디스플레이는 보통 항상 켜져 있어야 하기 때문에, 전력절감을 위해 설치되지 않거나, 꺼져있을 때가 많을 것이다. In addition, premises energy management system and the premises are usually displayed because it should always be on, or is not installed to save power, there will no doubt be times when it is off. 소비자가 전력 제어 장치를 전력 제어 그룹에서 탈퇴시키려는 예외상황이 생긴 그때에 그 전력 제어 장치에서 같이 탈퇴가 필요한 기기들과 함께 탈퇴를 명령하는 것이 가장 효율적인 방법이다. It is the most efficient way for consumers to unsubscribe command with the equipment you need, such as the withdrawal from its power control devices caused an exception, then I want to leave the power control in the power control group. 추가적으로 전력 제어 장치는 속성 정보들을 가지고 이러한 후보 기기들을 자동으로 제시할 수 있다. Additionally, the power control apparatus can be automatically presented with these candidate device with the attribute information. 소비자 댁내에 댁내에너지관리시스템과 댁내 디스플레이 같은 시스템이 있다면, 이러한 후보들을 미리 소비자가 선정할 수도 있다. If this premise energy management systems and premises displays such systems in the consumer premises, and these candidates may be pre-selected by the consumer. 예를 들어, 전력 제어 장치가 속한 그룹이 '최하순위절전그룹1'이라고 설정하고, 전력 제어 장치가 탈퇴할 때, 최하순위절전그룹내의 기기들이 같이 탈퇴할 것인지 소비자에게 질의할 수 있다. For example, setting the group of which the power control apparatus is called "the lowest ranking Sleep Group 1", and when the power control device withdrawal, whether the device to withdraw, as in the power-saving group the lowest rank may query the consumer. 또한, 전력 제어 장치가 탈퇴할 때, 탈퇴 이후에 여러 기기들의 동작 세트를 미리 정하여서 실행시킬 수 있다. Further, when the power control device withdrawal, can be run in a predetermined operation set of multiple devices, after the withdrawal. 예를 들어, 전력 제어 장치(LC1)가 탈퇴하면, 전력 제어 장치(LC1)의 대체 기기(LC5)가 동작하도록 동작 세트를 정하고 탈퇴한 전력 제어 장치(LC2,3,4)의 대체기기(LC6,7,8)를 작동시키도록 동작 세트를 정하고 명령한다. For example, the power control device (LC1) is, by leaving, replacement device of a power control device (LC1) power control apparatus (LC2,3,4) a replacement device (LC5) that establish a set of operations to the operation of withdrawal (LC6 , the command establish a set of operations so as to operate the 7, 8). 위에서 설명한 바와 같이, 탈퇴할 기기들을 선정하는 것이나, 동작 세트를 선정하는 것은 소비자가 한번 선택한 것은 다시 선택할 가능성이 있기 때문에, 다음에 탈퇴 명령이 발생하였을 때 전력 제어 장치는 그 후보를 소비자에게 우선순위로 물어볼 수 있다. As described above, short of selection device in order to leave, since it is to select the set of operations it is possible to select what the consumer once selected again, the power control unit when the following obtain specific withdrawal command generated in the first to the candidate to the consumer ranking you can ask to. 도 2에서 탈퇴 처리 절차를 예로 들어 설명한 것은 전력 제어 장치가 전력제어이벤트 종류와 전력계약에 따라서 기본적으로 참여(Participation, Opt-In)하도록 하는 때를 예를 든 것이다. It is also described, for example in the withdrawal procedure 2 is shown as an example the time of the power control device so as to basically involved (Participation, Opt-In) according to the power control event type and power contract. 전력제어이벤트 종류와 전력계약에 따라 전력 제어 장치가 기본적으로 참여하지 않을 수 있기 때문에, 다음과 같이 참여일 경우도 탈퇴 절차와 같은 방법의 적용이 가능하다. Since the power control apparatus according to a power control event types and the contract power can not participate as a default, when the engagement, as follows: Figure is applicable in the same way as the withdrawal procedure. 전력 제어 장치가 전력제어이벤트에 대한 탈퇴 선택을 받았을 경우, 바로 에너지 서비스 인터페이스 등의 전력제어이벤트 공급자에게 탈퇴로 전력제어이벤트 탈퇴를 보고하면, 그 전력제어이벤트에 다시 참여하지 못할 수 있다. When the power control unit is reported to withdraw when receiving the selection, immediately leave power control event to leave a power control event provider of energy services interface for power control event may not participate again in the power control event. 따라서 전력 제어 장치는 전력제어이벤트에 명시된 랜덤마이제이션(Randomization) 허용 여부와 전력 제어 장치 자체에 허용된 최대한의 랜덤마이제이션 시간을 활용하여, 다음 전력제어이벤트에 간섭을 주지 않는 범위 내에서 전력제어이벤트 시작 시간을 조정(예:늦추는 조정)하고, 전력제어이벤트 시작허용시간 바로 전까지 소비자가 참여할 수 있는 선택의 기회를 남겨놓는다. The power control apparatus whether or not the random Mai Localization (Randomization) allows specified in the power control event and the power control apparatus to take advantage of the maximum random Mai Localization time allowed for itself, power control within a range that does not interfere with the following power control events adjust the start time of the event (eg, delaying adjustment), and starts a power control event allowed time immediately before leaving a choice that consumers can participate. 전력제어이벤트 참여 여부가 전력계약기반 할인에 직접적인 영향을 끼치므로, 효율적인 전력제어이벤트 관리 방법이 된다. Whether the power to control events involved kkichimeu a direct impact on power contracts based discounts, are an efficient power control event management. 이상 위에서 설명한 방법들은 전력제어이벤트 제어뿐만 아니라 분산전원제어에서의 분산전원 제어에도 똑같이 활용할 수 있다. The method described above may be equally or more to take advantage of distributed power control in a distributed power control as well as power control event control. 예를 들어, 소비자의 분산전원에서 역방향으로 전력공급자에게 전력을 공급해주기를 바라는 명령일 경우, 전력공급을 중단하는 탈퇴와 전력공급을 개시하는 참여가 있을 수 있다. For example, there may be times when one wants to command a distributed now reverse power supplies power to the electric power provider in the consumer, to leave off the power supply to initiate and participate in the power supply. 이와 같이 동작할 분산전원 장치들의 후보를 선정하여 표시하거나, 그 이후의 동작 세트를 적용할 수 있으며, 랜덤마이제이션 기간을 활용하여 효율적인 분산전원 관리방법을 제공할 수 있다. Displayed by selecting a candidate of this power distribution device to operate as, or can be provided that can be applied to a set of operations, and the subsequent, efficient distributed generation by utilizing random Mai Localization term management. 상기 제1 전력기기와 상기 제2 전력기기 이외 상기 전력 제어 그룹에 속한 전력기기에 대해 탈퇴 여부 또는 대체 동작 여부를 질의하는, AMI 네트워크에서의 전력기기 관리 장치. The first power unit and the second power device other than the electrical equipment in the AMI network management device to query whether or replace operation if withdrawal for electrical equipment belonging to the power control group. 상기 제1 전력기기의 속성 정보를 참조하여 전력기기의 리스트를 제공하는, AMI 네트워크에서의 전력기기 관리 장치. , Electric equipment management apparatus of the AMI network that provides a list of the power device with reference to the attribute information of the first power device. 상기 선언에 연동하여, 상기 제2 전력기기를 동작시키는, AMI 네트워크에서의 전력기기 관리 장치. Electric equipment management apparatus of the, AMI network in communication with the declaration, operating the second power device. 를 더 포함하는, AMI 네트워크에서의 전력기기 관리 장치. The, electric equipment management apparatus of the AMI network further comprising. 를 포함하는, AMI 네트워크에서의 전력기기 관리 방법. , Power equipment management method in a network including the AMI. 를 더 포함하는, AMI 네트워크에서의 전력기기 관리 방법. A method of power management devices in the AMI network further comprising. ITTV20120208A1 (en) 2012-11-07 2014-05-08 Regal Grid Srl "System and device architecture and management for micro - with generation networks, storage and consumption of energy"